Here in Congress, healthcare consistently ranks as one of my highest priorities while serving Georgia’s 13th Congressional District. That is why each year I host a Health Fair for my constituents to receive free preventative medical care from our region’s best doctors, nurses, hospitals and healthcare professionals. Register now for the 14th Annual Health Fair! Join me on Saturday, August 11 at my 14th Annual Health Fair and take advantage of free screenings including: breast cancer screenings, prostate cancer exams, HIV testing, blood pressure checks, blood donation, body mass index, dental, glucose, kidney function tests, cholesterol, orthopedic, spinal, general vision, glaucoma and many more. Participants include: Emory Hospital, Grady Health System, Morehouse School of Medicine, WellStar, AID Atlanta, Sisters By Choice, Radiotherapy Clinics, American Kidney Fund, Children’s Healthcare of Atlanta, LifeSouth Community Blood Centers, Clayton County Senior Services, Insure Georgia, CareSource, SSA, Centers for Medicare and Medicaid Services, CDC, FDA, DFCS, and others. Click here for a full list of participating healthcare providers. For our veterans, the Atlanta VA Health System and Atlanta VA Regional Benefits Office will return to provide mental health services, medical appointment scheduling, disability claims updates, and referrals for veterans services. 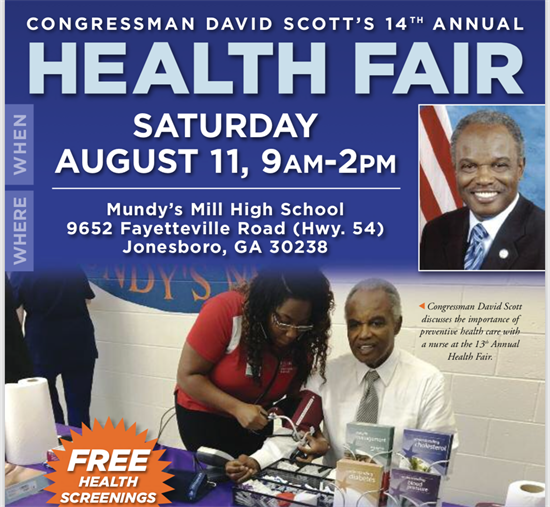 Please visit www.davidscott.house.gov or call 770-210-5073 for more information.I also encourage you to follow me on Facebook, Twitter and Instagram for up-to-date information on the Health Fair and my work on your behalf in Washington.